Here's Joyce describing the voice of his favourite singer, the Cork-born Franco-Irish tenor John Sullivan, king of powerful high notes. Although he liked to compare his own voice with John McCormack's lyric tenor, Joyce felt that Sullivan's heroic tenor soared above both of them. Mutual admirers, Joyce and Sullivan were close friends and drinking companions. In the Wake, the singer appears as 'Jean Souslevin' (John under the wine/vine). 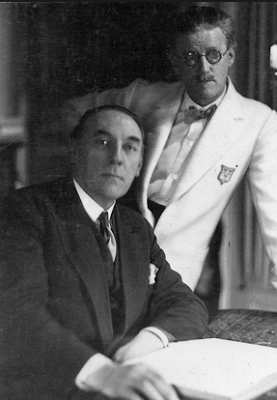 Joyce first learned of Sullivan in a letter from his brother, Stanislaus, who met the singer in Trieste, and found him reading A Copy of A Portrait of the Artist as Young Man. This predisposed Joyce to like Sullivan. 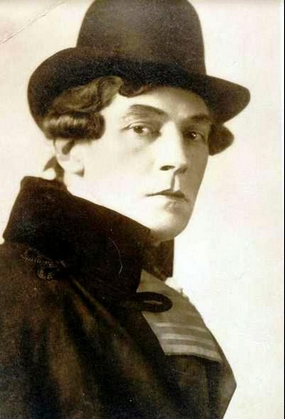 When he later heard him sing, in Tannhauser at the Paris Opera in October 1929, he was overwhelmed by Sullivan's powerful voice. 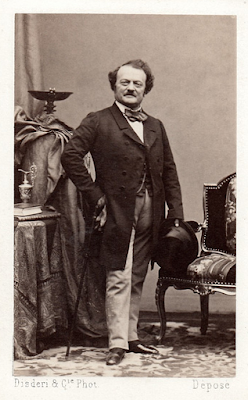 Joyce developed an obsession with promoting the singer, who he felt had been unfairly treated by the opera establishment. Joyce, 47 years old when he first heard Sullivan, was going through a mid-life crisis. He discovered the singer while he was suffering from a serious writing block – partly caused by a deterioration in his eyesight and also by the closure, for economic reasons, of transition. He no longer had an outlet for his writing, and could not face the huge effort of beginning the still unwritten Book Two of the Wake. 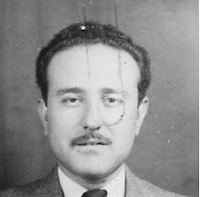 I recently had the pleasure of having lunch with the Joycean Arnold Goldman, a near Sussex neighbour of mine. Arnold told me about a documentary he made in 1972 for Radio 3 about Joyce's Sullivan obsession. He interviewed Lucie Léon, Maria Jolas, Philippe Soupault and Nino Frank who talked about this extraordinary time in Joyce's career. Here's one of the records Joyce made the Léons play. Arnold in Rossini's William Tell is one of the most demanding tenor roles in opera. In 1829, when Rossini wrote it, it was usual for tenors to sing high notes using a falsetto 'head voice'. But in 1837, Gilbert-Louis Duprez, a young French singer, caused a sensation when he sang the highest notes in full 'chest voice'. After Duprez, everyone expected tenors to use their chest voice (although Rossini thought that Duprez sounded like a capon having its throat cut!). Here's the tenor Carlos Barcenas, who also sings Arnold, showing the two ways of singing a high C.
Those were the moments that James Joyce went to the opera for, and Sullivan always provided them. Listen to him here, singing Arnold's big aria. Joyce's rather excessive technique at the Paris Opera began to do more harm than good, I fear. For one thing, it got on the nerves of the director...Sullivan was alarmed when he found himself practically eliminated from the programs. We would call up the box office and book seats for Guillaume Tell, maybe a whole box. But we made it clear that it was Sullivan we wished to hear as Tell. And if we were told it was not to be Sullivan, we canceled the booking. This happened so often that the box office got riled and stopped answering the telephone. On Twitter, Patrick Hawe posted a letter written by Joyce's 'biografiend', Herbert Gorman, to the Dublin journalist Patrick Corrigan. 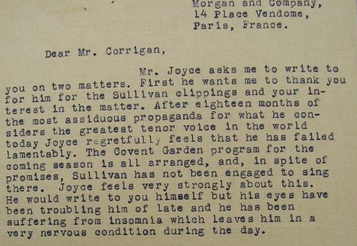 He talks about Joyce's efforts to get Sullivan a booking at London's Royal Opera House in Covent Garden. *Tim Finnegan has put the whole text, with notes, of From a Banned Writer to a Banned Singer, on his excellent origins of Finnegans Wake blog here.